When your car gets older, the doors will slowly sink into the doorrubbers. This is absolutely normal for a door rubber. However, when the doors sink into the rubbers, people are becoming aware of a rattling sound coming from the doors. This sound is produced by the lock mechanism onto the striker pin. The main reason for this is that the striker pin is too small for the lock mechanism. This will get worse over time and at the end, the door will rattle on each bit of rumbly road. You can try to get rid of the rattling by adjusting the striker, but you will soon find out that this doesn't exactly work. The striker is simply not up to the job. 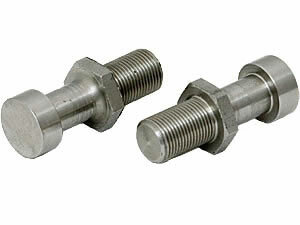 These Anti Rattle Door Striker pins come per pair and are a direct replacement for the original Striker pins. You just replace them, adjust them and the door will stop rattling! When you replace the Door Striker Pins from new, or in any way before the doors start rattling, you will save the lockmechanism from wearing out as well!